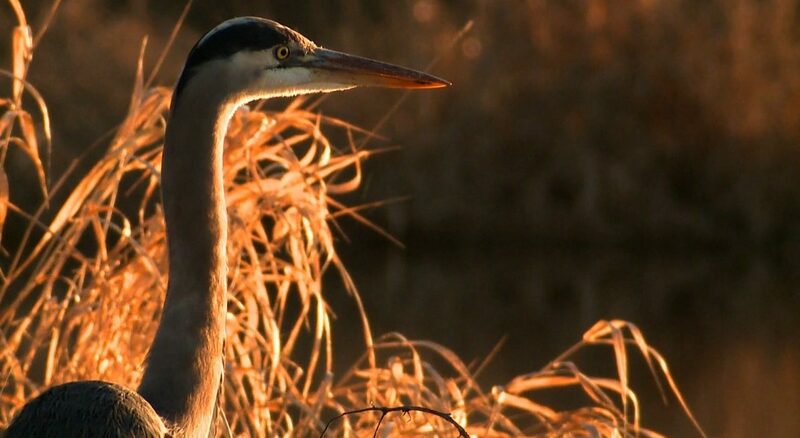 If you’re a fan of Oregon wildlife, there are many seasons when you can catch the sky show of waterfowl and raptors that migrate through the state. And you can see nearly every raptor species that makes Oregon home at places like the Cascades Raptor Center in Eugene. There’s goose ‘song’ in the air – have you heard the excited sound? It’s hard to miss as the flocks seem seem to shout: “We’re here – in Oregon – at last!” It’s especially loud and strong at places like William Finley National Wildlife Refuge near Corvallis along the Homer Campbell Memorial Boardwalk. “The refuge is a magnet for wildlife we’ll have thousands upon thousands of ducks and geese and swans here within the next few months,” says US Fish and Wildlife Biologist Molly Monroe. Fast on the tail feathers of the abundant waterfowl flocks are the raptors; hundreds of hawks and eagles that pass through or winter over in Oregon. You’ll want to stop in and winter awhile at the Cascades Raptor Center in Eugene. It’s a wildlife rehabilitation clinic that helps sick and injured birds of prey. Scores of birds – most of them seldom seen at such a close range – like a red-tailed hawk, a barn owl and a white-tailed kite, arrive at the Center each winter thanks to volunteers who often recover the hurt birds in the field. In fact, the Cascades Raptor Center has been in operation since 1990 as a wildlife hospital and educational site. You can see and learn about 34 different raptor species across the three acres the center calls home. Shimmel says education about raptors has made a big difference to our understanding and appreciation of the birds. “Raptors have had a huge perception shift from vermin and bounties to majestic and beautiful! Back in the 1950’s, there were bounties on hawks and eagles and today we understand the value of the predator-prey cycle,” she says. Still – thoughtless injuries persist. Shimmel showed off a Swainson’s Hawk that was shot by a poacher and will never fly again. It has become an ambassador of sorts – in schools and at the center – teaching people more about raptors. 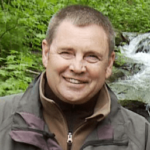 Volunteer Dan Gleason says that the Cascades Raptor Center is a fine place to visit and learn what the varied raptors look like before heading out to see them in the wild. “That’s one way – to see them up close and then go out and see them in their natural habitat. That helps folks understand what they see especially since you can see them up close here,” Gleason says. Gleason added that bald eagles are a favorite for many birders because the big birds are more common (and even abundant) in some parts of Oregon, and because they are easy to spot – especially sporting the tell-tale white head and tail feathers that mark a mature bald eagle. 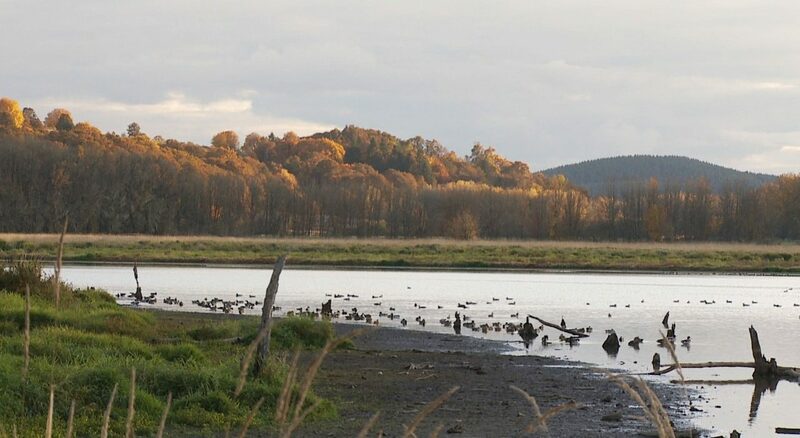 One of the best places to spot a bald eagle or two or three is the nearby Fern Ridge Wildlife Area that is managed by the Oregon Department of Fish and Wildlife. It is made up of more than 5000 acres of wetlands, ponds and sloughs and upland areas according to Kevin Roth, the wildlife area’s Assistant Manager. “We are a fine place to start – not just to view the waterfowl that use the wetlands and ponds, but the raptors too. Our number one goal is to provide food, water, sanctuary for wintering birds and at times we’re like a magnet. You will see several species in just one visit,” he says. The Cascades Raptor Center is also a perfect place to begin your raptor-watching adventures. The center offers “handler talks” each Saturday and Sunday at 1:00 p.m. sharp. It’s a great chance to get a close-up view of many raptor species. You can also find additional places to watcher for waterfowl and raptors with the new ODFW Wildlife Viewing Map. It’s a fine resource for locating the best wildlife viewing sites across Oregon.